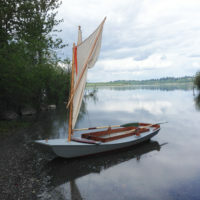 In 1913 England’s Boat Racing Association, a small club of sailing enthusiasts, called for a design to comply with the following requirements: length 12’, beam 4’8”, and a single 100-sq-ft sail with no battens; she should be a capable rowing boat as well as a good sailing craft, suitable as a tender for larger yachts. The winning design was submitted by an amateur designer named George Cockshott. 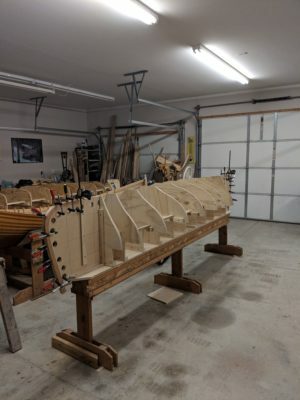 Only when you've devoted over two decades to kayaks is a boat shy of 12' a step up to posh accommodations. 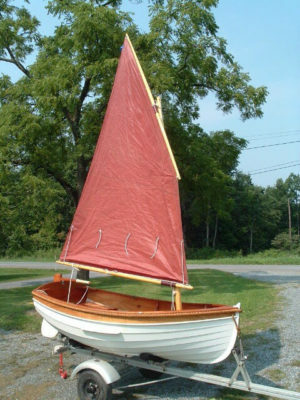 Harvey Golden, a long-time kayaker, built Chapelle's smallest garvey as his first camp-cruiser and thoroughly enjoyed his shakedown cruise, even though he spent his days and nights in a cockpit not much bigger than a bathtub. 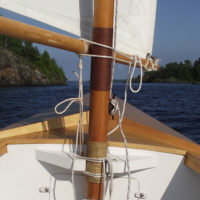 There are lots of jobs aboard the boat and in camp that can be performed well with a bit of line, and a few variations on a simple quick-release tension knot. Tension is easy to achieve and adjust even without blocks and the absence of fittings keeps things cheap and quiet. 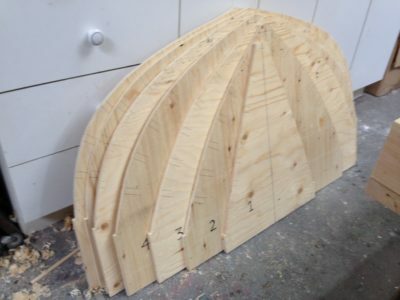 A bit of keeping up with the Joneses led Lorenz Rutz to build PEARL, a 12’ Wee Rob canoe designed by Iain Oughtred. 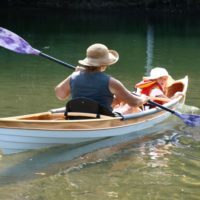 His wife Shari enjoyed kayaking but struggled with her 60-lb plastic kayak. Lorenz would help her load the boat on their truck’s canopy roof rack, but she would return with it slid in on the truck bed. Take shelter from bugs, sun, and rain without retreating to the confines of a tent. A ski-goggle approach to safety glasses is a step up in protection, comfort and clarity.